China?s new moon probe arrived at its destination today(Oct.6) after firing its braking thrusters to enter into lunar orbit, accordingto state media reports. The unmanned spacecraft Chang'e 2is China's second moon orbiter. It entered a 12-hour orbit around the moonafter completing a five-day trip from Earth, China's Xinhua News Agency reported. 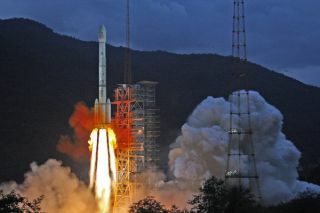 Chinalaunched Chang'e 2 toward the moon on Oct. 1 atop a Long-March-3C rocket from Sichuanprovince. The mission follows the successful flight of China'sfirst moon mission, Chang'e 1,which crash-landed into the lunar surface as planned in March 2009. Twomore maneuvers are planned to steer the probe into its final, 118-minute orbit. Themaneuver "laid a solid foundation" for Chang'e 2 to carry out scienceobservations in its final orbit, BACC said in a news release, according toXinhua. Thissecond lunar probe is slated to orbit closer to the moon ? at an altitude of about60 miles (100 kilometers) above the surface, compared to Chang'e 1's height of120 miles (200 km). Chang'e 2 also traveled to the moon much more quickly thanits predecessor. Thenew probe is the second stage inChina's three-phase Chang'e moonexploration program, named after China's mythicalmoon goddess. "As a major country, Chinahas the responsibility to participate in the activities of outer space forpeaceful use and make its own contributions," Qian Weiping, chief designerof the Chang'e 2 mission's tracking and control system, told Xinhua.